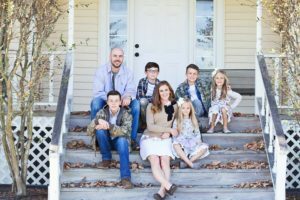 Josh and Ashley Christian had driven their family down the long, gravel road to their house thousands of times before. But on this cold mid-January afternoon in 2017, something about that drive was different. As the kids and I approached the house we could hear an uneasy chorus of beeping and so we listened. Once we parked it was clear, the alarming noise was from the smoke detectors, and as I opened the front door a thick, choking cloud of smoke poured out. I told the kids to stay put as I ran inside to discover a kitchen fire which was easily put out and then ran back to gasp down the fresh air on our porch. I must have gone back and forth dozens of times, getting our dogs out of the house and opening windows, a part of me still believing it wasn’t that bad and if only I could air it out we’d be okay. But it wasn’t okay, not at all. As the air cleared and my husband and oldest son came home, we discovered a thick, greasy layer of smoke residue covering every surface in every room. 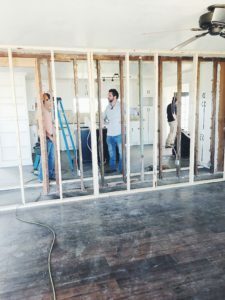 We tried to gather basics for everyone before leaving, only to find the smell could not be washed out, and that even items in cabinets, drawers, and closets were permeated with the terrible stench. I washed my hair 5 times that night only to have that sickening reminder stay with me, we couldn’t get away from it. The smell was like death, and it was a death in our lives as we lost home and every earthly possession in it. It took a few days for us to gather all the very basic things we needed. We were thirsty because the water in our freshly cleaned bottles still tasted of smoke, I was hungry because of the logistics of a mom just trying to survive, I was freezing during one of those first winter days and remember seeing a family all bundled up, just wishing I had a coat like them, and my husband wore the same smokey pair of jeans for 5 days before I could get him new ones. We were in shock and grieving and exhausted. Our spiritual family showed up right away, sacrificially they cared for us, they gave unrestrained to us in every way imaginable. If we were to try and calculate or even record every gesture of love towards us we simply could not, it’s depth is impossible for us to comprehend, overwhelming in every way. Dozens of people showed up to our ruined house. 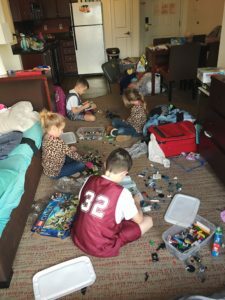 They recorded, photographed, itemized, and organized every single item we owned, the heavy weight of that task being lifted was an immense comfort. Stephanie Goslee, who had coached us through our financial peace journey and leading a group, sat with me in gloves and a mask as I tearfully sorted through my boy’s room, it was a tremendously sad day and I couldn’t have done it without her. Sara Walker brought her sister and they rolled up their sleeves and completely organized and swept our dirty old country barn so that we could store donated items in it. I have been so grateful for that space so many times in the months to follow. Belinda Hurst, Shannon Linton, and Kathleen Tysinger, three close friends from California who had all moved to Texas and found a home at Milestone Church as well came to help, washing and feeding our dogs, meeting me at the hotel with a car full of groceries, and helping us sort through everything. Our dear friends Curtis and Amanda Merritt let us spend all day on Sundays at their home while we were in the hotel, doing laundry, helping us process everything, and feeding us several meals. John and Courtney Critz who we met when we first moved to Texas, lent us their travel trailer to park on our property and stay in for the next couple months as our house was repaired so we could be “home”. Another family from Milestone offered to drive their 5th wheel from Oklahoma if we needed. Ben Collins came to our hotel to bring blankets and water bottles, and other things we needed and stayed just to play basketball with our hurting teenager. Christi Brown brought her girls and helped us move from the hotel to the trailer. Mallory Harris lent us sleeping pads to use when we didn’t have enough beds and several ladies from church donated basket of things from their home businesses to bless us with the comforts of home during transition. More people than I can count handed us money, sent gift cards, created a fire relief fund for us, and donated more items than we can even wrap our heads around, they would more than fill our garage if all stacked together. Two months later, we are finally home again, still unpacking boxes, still doing repairs, still sorting through insurance forms, still overwhelmed, but that’s okay. Even in the pain, unknown, loss, stuffed with seven cranky people in temporary living spaces, sleep deprived, and grieving, God has done abundantly, exceedingly, more than we could have ever thought, asked, or imagined. Because of Financial Peace University we had reduced our consumer debt to almost none and completely changed our home-owner’s insurance before the fire. We honestly don’t know how we would have made it without that. 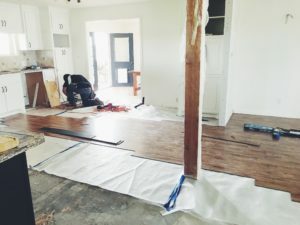 And from the ashes and fire, we have essentially had our house remodeled and all our belongings replaced—a story of God’s care and goodness for us everywhere we look and a poignant reminder that He is working for our good long before we can see. As I recall the extravagant, incalculable ways God has used our spiritual family, and intimately interwoven them through every detail of our experience with the fire, I am deeply humbled and grateful that God placed us at Milestone Church. My heart breaks for a world that walks through crisis alone, unconnected and desperate, they need what we have. 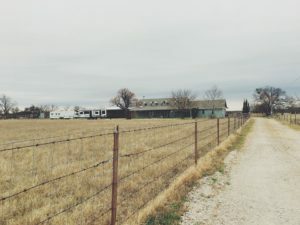 Moving out of our home, into a hotel, into a trailer, and moving back again was intensely stretching, more so than I could have imagined, but also fuller of God’s gracious healing and goodness than I ever dared to dream. I believe the same is true for our church as we move into our new home in a few weeks, learning a new building, greeting new faces, adjusting ourselves, it will be stretching and uncomfortable, but those new faces need what we have, they need Jesus and spiritual family as they walk through their own fires of life. I believe the goodness God has planned for our church through this transition is so far above our comprehension, because that’s who He is and that’s what He does. He trades our ashes for beauty, and we get to be part of the story He’s writing! You are such a treasure to us, Ashley! We love you all so much! What an incredible story and so well written. It’s an honor to know this family. They have been through so much but they have walked through it all with grace, love, and faith. Way to go!!! Thanks for sharing Ashley, your family is an inspiration to countless others. Love and miss you all! So many tears and such an incredible story. Our spiritual family is simply amazing. It’s God’s Plan A (and He doesn’t have a plan B). The Local Church…so awesome. Literally in tears reading through this! What an awesome testimony if spiritual family, and keeping the right perspective through an incredibly difficult situation. So awesome! What a beautiful written story of the power of spiritual family. This is the Church being the Church! Thank you for sharing with us, Ashley!